For 100 years, Russ & Daughters has been serving delicious smoked fish to New Yorkers from its original location in the lower-east side. Filmmaker Julie Cohen took it upon herself to celebrate the centennial cinematically with The Sturgeon Queens, a jaunty chronicling of the store’s history that’s both full of attitude and touchingly nostalgic. In a wonderful stroke, Cohen uses faithful Russ & Daughter customers to narrate the film, with talking head interviews with both store employees, past and present, and celebrity devotees (Maggie Gyllenhaal, Supreme Court Justice Ruth Bader Ginsburg, Mario Batali, and others) to round out the warm tribute to the NYC institution. The film will be screening at multiple venues at the San Francisco Jewish Film Festival. We spoke to Julie about the project appealing to people of many backgrounds, her first time visiting the store, the idea to have customers narrate the film, the controversy surrounding the “Super Heebster” sandwich (wasabi roe, salmon, and cream cheese on a bagel), and more. 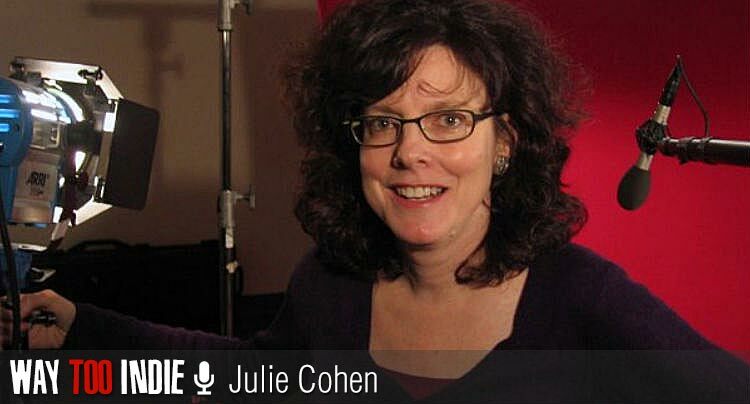 Julie: About six years ago, New York PBS asked me to quickly put together a wide-scope film about Jews in New York, basically. I came up with six different slice-of-life stories and put them together for the film. I knew I wanted to do a story about Jewish food on the lower-east side, so that’s how I chose Russ & Daughters as a subject for that film. I thought Russ & Daughters really deserved its own film. The sit-down interview with Anne and Hattie in Sturgeon Queens is from that older film, and I used it because I knew that I had so much great material with these two wonderful characters. I had put the idea for the film aside for some years, but I knew that the 100th anniversary of the store was coming up in 2014, so it seemed like the right time. As an Asian guy from San Francisco, I’d just like to say that your film makes being Jewish look really, really cool! I’m a little jealous! Julie: Maybe it’s not as cool as we make it look, [laughs] but I’m really happy that it’s relatable not just to New York Jewish audiences, but also to people with all different kinds of backgrounds. Especially immigrant backgrounds. In the credits, we include the immigrant stories of a lot of our major crew. I had crew members who came from all over the world, with different immigration stories, whose families had a lot of similarities that maybe we don’t think about so much. Can you recall the first time you stepped into Russ & Daughters? Julie: My first Russ & Daughters experience was when I was shooting that first movie. I don’t know how I had missed it prior to 2007, but I had! For somebody who grew up eating a lot of that kind of food–smoked fish, borscht–except MUCH less-good versions of it…Ecstasy may be a big word for it, but it’s somewhere around there. That kind of food has a whole lot of emotional content for people of my background. When I have pickled herring, it brings back all kinds of great memories, mostly of eating big brunches with my parents and grandparents. But the version that I was eating 30 or 40 years ago was not nearly the quality of what Russ & Daughters is putting out. Their food is completely delicious and first rate. Usually, things are never as good as you remember them, but Russ & Daughters is what you remember, but better. 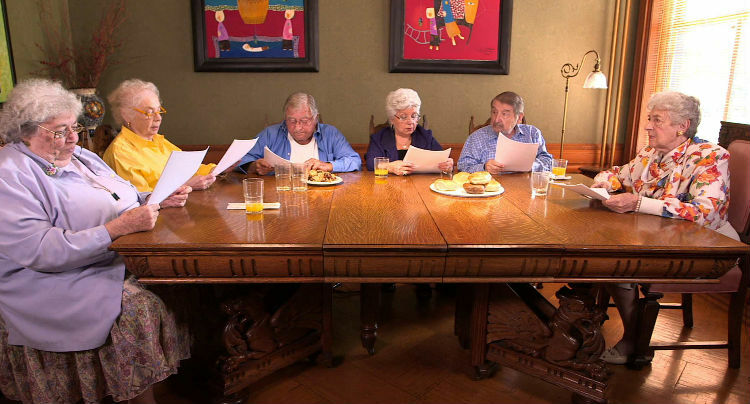 Having the customers narrate the film Seder style was a great decision. What I particularly liked was how you included the mistakes they’d make while reading. You including the flubs is great because it loosens the film up a bit. It’s informal and allows us to relax a bit as an audience. Julie: The idea was that I wanted the film not to feel super self-important and pretentious. I was hoping it would have the same warmth as the store does. The Yiddish word for that is “hamish”, which kind of means “salt of the earth.” It’s funny to hear people pointing that out. “It’s not super intellectual!” That’s not exactly what a filmmaker is seeking to hear from people! [laughs] When you call a person “hamish”, it’s good, but like a lot of Yiddish words, it’s not 100% a compliment. But I embrace it, because I want this to be a film for everybody to enjoy. This isn’t Truffaut or Fellini! What I found striking about your celebrity interviews was how full of love and affection they were. They’re just beaming with joy when talking about the store and their favorite products. Julie: Particularly from someone like Justice Ginsberg, who is known for her seriousness and intellect. She was almost childlike and giddy in her love for the smoked fish. It goes back to the feelings food can provoke for people who grew up eating it. My wife and I will be traveling to New York this winter. What do you suggest we get at Russ & Daughters? Julie: The Gaspe Nova is delicious. They have seven different kinds of lox, and that’s my favorite. I love their pickled herring, and they have a lot of different varieties–mustard, curry–but I prefer the old-fashioned cream and onion variety. The Super Heebster, which is discussed with some controversy in the film, is REALLY delicious. Despite the controversy surrounding the name of it, audiences don’t seem to be bothered when they hear the name. It makes people laugh. During the moment when the green, wasabi-tinged fish roe is spread on the bagel, all of the old Jewish audiences will gasp in horror! It’s scandalous to them, but I would highly recommend the Super Heebster to you and your wife.